I wanted to inform you that the tournament has been delayed until Saturday December 13th, but it will still be held at LDMS. We simply had too many open details remaining, and not enough time to properly advertise to make this a successful tournament. Sorry for any inconvenience. Looking forward to seeing you all next Wednesday the 1st for our first class at MHS! The upcoming tournament at LDMS on October 25th will be here before you know it! You may be aware that, aside from being a great tournament for our players and representation of Muskego chess, this is our main fundraiser for the club. But in order for it to be successful, we need a lot of volunteers. I will bring a sign up sheet to the first class on October 1st, but in the meantime if you know that you can help, please let me (dan.schantz@aptar.com) and/or Leah (leahmike@ymail.com) know. If you'd like to place your Chess Merchandise Order before the season begins, please e-mail me at leahmike@ymail.com & I will give you my address. I also acccept PayPal. 1/2 Chess Lessons Wednesday September 10th and 17th! Mr. Matt here! Resident Chess Instructor. Wednesdays I'm at the Muskego Public Library for Chess Lessons and normally I'm entirely full. However, due to some conflicts (many of my clients are in cross country), I've got two time slots with no lessons! I'm offering 1/2 off my normal rate for lessons for anyone that wants to take one or two (or all) of these four time slots. 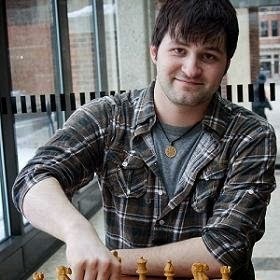 If interested, please e-mail me at Matt@IA-Chess.com or send me a message on Facebook (https://www.facebook.com/MattSchladweiler)! The slots will go to those who contact me first! (I'll update here and on Facebook when they are grabbed). If you don't know me: I've been a Professional Chess Instructor for over 10 years now and am the Owner of the International Academy of Chess (www.ia-chess.com). My students and teams are State Champions at all scholastic levels. Note: We just relaunched the site, so it is a little bare, but expect it to fill up with tons of information on upcoming camps, tournaments and articles soon! Lake Denoon Tournament cancelled for Oct 25- we'll have it later in year! I have finalized the MSCC Merchanise form. If you would like to get ahead start & look at the cool clothing, please e-mail me at leahmike@ymail.com. Just like last yr, the club will get $2 from every piece of clothing (w/the exception of the track jackets). Due date's Wed, Oct 8. Thanks!